Resources > Decks & Porches > A Guide to Decking Materials: Which is Right for Your Home? There is something liberating about spending time outside on a deck. 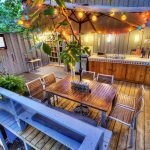 Whether you make it a private retreat shaded by vegetation or an energetic entertainment area complete with a built-in BBQ, this outdoor living space is often the most enjoyable area of a home. It also increases the value of your home. 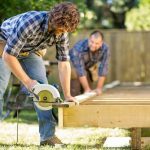 Most homeowners see a return on investment between 74 and 87 percent after adding or renovating a deck. Before you start building, however, you want to make sure that the material you choose matches the exterior of your home and fits lifestyle. This quick guide on some of the most popular decking materials will help you decide which material best suits your needs. 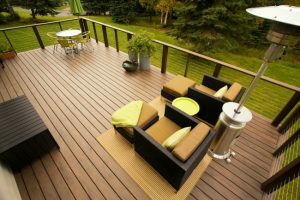 Wood decking is the most common choice for residential decks. Durable and strong, it also offers a classic look that complements traditional, craftsman and virtually any other style of home. The smooth planks stay cool and feel good on bare feet, making wood a natural choice for building your outdoor oasis. Softer woods are fairly easy for a novice do-it-yourselfer to work with; hardwoods generally require a stronger skill set. The price of wood varies greatly depending on the type you choose. Pressure treated pine is the least expensive material, but typically needs to be replaced after about 10 or 15 years. Tropical hardwoods such as ipe, cambara or garapa look stunning and last for upwards of 30 years and cost quite a bit more per lineal foot. Cedar and redwood are popular choices that fall in the middle of the price spectrum and have a lifespan of about 20 years. Professional installation will add to the price of the deck. Regardless of the type of lumber you choose, it will require a fair amount of maintenance. 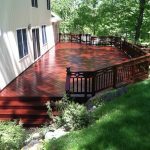 Wood decks needs to be cleaned annually and restained and resealed every few years. You may also need to replace a board or two over the life of the deck. 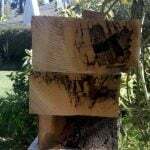 If not properly maintained, the wood will absorb stains—especially red wine or BBQ sauce—and will be more prone to cracking, rotting and warping. Composite is an environmentally-friendly choice for those who love the look of wood but aren’t as enamored with the upkeep. Premium planks boast a textured surface that mimics the look of wood grain. Made from a combination of recycled plastic and waste wood fibers, composite is available in an array of colors and makes a stylish addition to most any home. Some types of composite also feature grooves in the edges of the planks to allow for hidden fasteners—no unsightly screws. Composite decks are relatively easy to install, but it is imperative to follow the manufacturer’s instructions to allow enough room for heat expansion. You can expect to pay more for composite decking than for wood boards. It can run two or three times as much as pine, but usually costs less than exotic hardwoods. Extras, such as scratch resistant features and UV coating, will up both the price and the life expectancy of the deck. 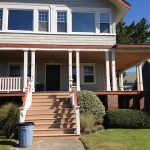 Homeowners will likely recoup the additional costs though, since there is not as much maintenance involved over the life of the structure. 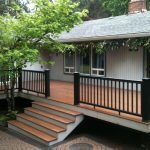 Need to find a pro for your deck project? Smooth and splinter-free, this lightweight material is strong enough to withstand the harshest elements of nature. It is impervious to stains and resistant to fading, making it a great choice for an outdoor dining area. Unlike other types of decking, plastic decks typically feature a non-slip coating that becomes less slippery when wet. Even with a faux-wood grain finish, this material does not look natural and may clash with homes that have wood or stone exteriors. The synthetic material also gets rather hot in direct sunlight and can burn bare feet. Plastic decking does not necessitate any sanding, staining or painting. All it requires is seasonal cleaning to keep it looking fresh and new. Anodized aluminum decking offers a modern look that pairs well with contemporary style homes. It is also a viable choice for destination decks near natural streams or manmade water features because the textured finish boasts added traction. It also stays cool, making it barefoot-friendly even in sweltering temperatures. Aluminum is one of the higher priced types of decking material. 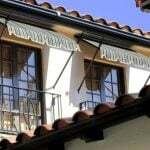 Features such as a polyuria coating to reduce the sound of footfalls and tightly interlocking planks to prevent water from penetrating below will add to the price as well, but are worth the investment—especially on second story decks. Like other synthetic decking materials, aluminum is virtually maintenance free. It will not rust or rot and is resistant to mold and mildew. A quick sweep of the broom to keep it free of dirt and debris or an occasional hose down to remove bird droppings or sap is all it requires. These are four of the most popular types of materials used to construct residential decks. Even though wood is the most prevalent material, that doesn’t mean that it is the right choice for your home. Take the time to consider the location of your deck, its intended use and how much maintenance you are willing to take on before committing to a certain material. A well-designed deck built from the right decking material has the potential to become the best part of your home. 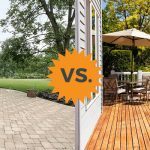 What are the Differences Between a Deck and Patio? We love spending time outside so we use our deck quite a bit. We have a vinyl deck and we love it because it is very low maintenance and durable. I think it is a great option if you have bad weather where you live.